There has always been a quiet sanctuary in the outer perimeter of the grocery store, where especially in produce, there is notably less structured packaging. 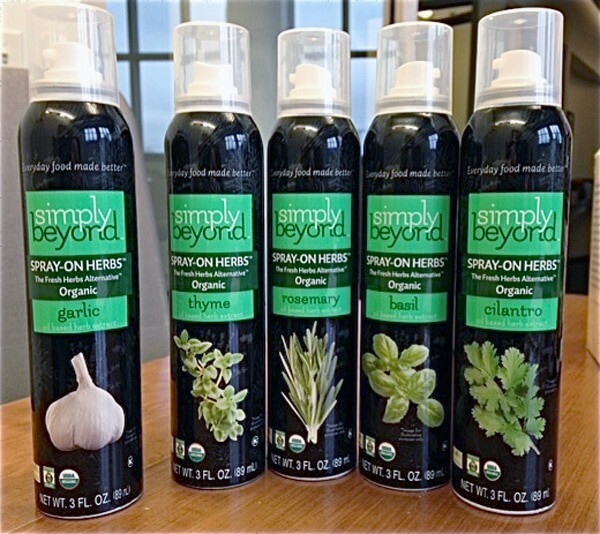 Yet increasingly we are seeing packaged products intruding into the produce section to compete for our attention – most notably fresh juices, packaged herbs, and the new addition to our local organic produce section, Simply Beyond Spray-On-Herbs. What caught my eye was the juxtaposition of a structural package – and a spray can at that – amongst the organic fruits and vegetables. To me, it was a contradiction of terms and with my curiosity piqued, I had to find out more. The visual design for the product creates a strong “family” feel. All of the packages are the same size and format, have a solid black background, and use an identical design grid and color palette. The only noticeable variable between the individual packages is reflected in large, full-color visual images of lush, fresh herbs. Branding and supporting descriptive copy are the same – the only difference being a line of copy identifying the herb. My challenge in relating to this package is that I could not quickly resolve how one would spray on a herb. As opposed to the image of the fresh herb on the face panel, how do you have to modify a herb to make it sprayable? I have locked in the paradigm that herbs are plants with leaves and seeds yet this product was clearly communicating herbs in a spray container. Hmmmmm. What was not easily or clearly communicated was that the product is a “Fresh Herb Alternative.” It took a lot of visual digging for me to recognize this was alternative speak for herb-flavored canola oil. I realized I was making assumptions based on the product visuals that were not necessarily accurate, but there was another issue. Yes, the package had shelf impact, but the copy, genuinely important to consumers was almost illegible in fine white type; it took far too long to discover what the product was and how to use it. I believe the mandate for effective packaging is to create a package that easily and effectively connects with the consumer. It should not simply attract the consumer eye to the package, but it should also put accurate decision-making information in the hands of the consumer. In my opinion, this package has a bold direct design but falls short with unclear messaging. I recommend calling the product what it is, rework the communication hierarchy to clearly and accurately communicate the message, and refine the color palette to maximize copy legibility. This packaging system comes so close to being a star that with mindful tweaking, it can build on its strengths to finish the job and successfully compete in a noisy world.